In 2013, Neil traveled to India with three friends to witness India Gospel League’s (IGL) growing ministry. In addition to teaching at a Pastor’s Conference, they traveled up steep mountains roads to visit a village transformed by the Adopt-a-Village program. This holistic program provides clean water, schools, vocational training, medical camps, Bible teaching, and much more. The trip cost approximately $3000 for each traveler, bringing the total trip costs to a hefty sum of $12,000. Many, including myself, would balk at that price. Wouldn’t that money be much better spent directly helping the people there? Couldn’t it go further there? Are these trips more for the travelers than those they’re supposedly serving? Are they financially inefficient? These are important questions. It took a decade of interest in short-term missions for Neil to find a organization and type of trip that seemed like a sensible partnership. Even still, it was hard to cough up $3,000 for travel expenses when many people lack basic needs. Should he skip the trip and give more? In the end we decided it was important to see the work firsthand, help with the organization’s need for Bible teachers, and meet and encourage our sponsored child. Neil benefited personally from the trip in many ways. He learned new things about himself, God, and the work going on through IGL. He gained a new perspective on the world and our family. But the trip also started a chain reaction of financial giving and spiritual impact, and the cumulative effect far exceeds the $12,000 the team invested. From a mathematical standpoint, this trip was far more financially effective compared to if we’d gifted $3,000 to the organization. For starters, while Neil’s team was in India they used their limited wi-fi access to connect unsponsored children they met with sponsors from our church. At least 8 children were sponsored at $360 per year, a commitment the donor can continue until the child finishes high school. When the team returned, they came with a huge ask: Could our church raise $75,000 over 5 years to sponsor a village in India through the Adopt-a-Village program? Many individuals in our church said yes, and our church was matched with the most remote village in the program. Since then, the village and church there are growing spiritually and economically. In the past year, a farmers group started meeting to help improve agricultural efforts. Eighty women attended a candle-making training to learn how to generate income for their families. Other women have been trained in tailoring, or making crafts or food to sell. Adopt-a-Village staff and leaders also gathered for training on communicable diseases, pre- and postnatal care, accessing government subsidies, running Women’s Transformation Groups, and character development. The people of this village have not been content to keep these benefits to themselves. Another important aspect of the ministry is outreach to other villages in the region. The pastor was walking up to 15 kilometers a day (over nine miles) through rough mountain terrain to share the gospel with neighboring communities. He was living the prophet Isaiah’s statement: “How beautiful on the mountains are the feet of the messenger who brings good news, the good news of peace and salvation, the news that the God of Israel reigns!” (Isaiah 52:7). When our church heard this we realized the pastor needed more than just his feet to carry the message—he needed some wheels. The church raised funds and bought him a motor bike. Since then the pastor has started churches in six neighboring villages. With the help his motor bike, the pastor recently discovered an extremely remote, primitive tribe which is unreached by any government structure. No schools. No health care. No running water or electricity. To address these urgent needs, our church is in the process of raising an additional $10,000. The gift will be used to provide educational materials for the school and daycare that IGL has started. The money will also provide skills training for villagers, and run medical camps since malaria is rampant. Are mission trips a waste of money? In Neil’s case, his team’s $12,000 investment has yielded well over $90,000 for the ministry. This has directly benefited hundreds of people whom the government was likely unable to help. Mission trips should not be a trap for endless fundraising. But done right, they can unlock support and action when others hear about an effective organization from a person they trust. In fact, all of our charitable giving has started as a result of hearing a friend speak about their firsthand experience with a particular ministry. Many of the benefits of a missions trip are difficult to quantify, but there’s no doubt Neil’s trip was a great investment in financial and spiritual impact. Without seeing the Adopt-a-Village program there was little chance our church would’ve felt ready to commit. Our $3,000 was just a drop in the bucket, and we’re excited to hear how far the ripple spreads. For more on short-term missions, read Are Short-term Mission Trips a Scam? and What Seeing Poverty Taught Me About Pretending to Be Poor. Do you believe mission trips are financially inefficient? How have you seen the ripple effect of a trip? “Side hustling”—the trending slang for working a second job—is a hot personal finance topic covered in a new book, Hustle Away Debt, by David Carlson. His personal finance blog, Young Adult Money, focuses on ways for millennials to increase their income and manage money wisely. Side hustles are great ways to increase the flexibility of how much you make. This is an important option for the many millennials who are drowning in student loans, or anyone struggling with debt. But side work is, well, more work. Carlson does a good job mentioning the pros and cons in his book, and offers realistic advice about how to choose the type of side work that will fit with your lifestyle. We did some side hustling before we had kids, and even when we had one kid. This included photography (wedding, portrait, etc. ), tutoring, coaching, babysitting, and writing. Now that we have two kids and a number of volunteer commitments, we aren’t focusing on this type of income, but it is a great option for tackling debt. I like that Hustle Away Debt suggests side hustling for a purpose—to get out of debt. I’ve known a lot of people who felt overwhelmed and defeated about their debt, especially if they felt their income was out of proportion to their debt. Side work offers a way to take the reins and make a dent in debt when you might not otherwise be able to. If you are living off your current income, side hustle becomes “extra” that can all go straight toward repayment. I believe any personal finance advice is best served with attention to motivation. Our motivation is what will carry us through all the extra hours of hard work and effort required when taking side work or changing financial habits. Hustle Away Debt is short and sweet. It reads like a series of blogs, with bite-size, easy to read sections. The pictures and type spacing are even formatted like a blog. What’s better than a blog is that the material is one place, laid out in an organized fashion. I’m a linear thinker and don’t like clicking all over the internet (or even one site) in search of comprehensive information on a particular topic. I enjoyed the straightforward, logical flow of the book. If you’re interested in tackling debt and willing to pick up a side hustle, this book will help you consider the options and pick the right approach for you. 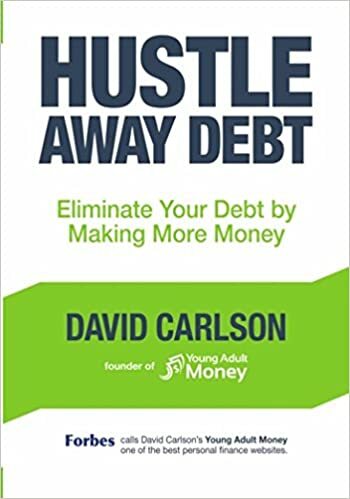 Hustle Away Debt: Eliminate Your Debt By Making More Money will be released on May 5, but is already available for pre-order on Amazon. Has side hustling helped you reach financial goals? What type of work have you done?